No other state offers such a unique choice of meeting environments, from quaint country inns to sophisticated urban hotels, spectacular casino resorts to the newest convention center in the Northeast. Connecticut’s got it all—fascinating attractions, great entertainment choices, New England beauty and charm. Plus, getting here is easy: we’re served by five major airports, and 20% of the nation’s population lives within a three-hour drive. From escorted tours to convention planning, contact one of our Regional Tourism Districts and Visitors Bureaus for more information on great Connecticut locations and operators to host your next meeting! Download one of our suggested itineraries below or contact any of the additional resources for personalized planning assistance. The relaxed New England charm that has made Mystic a well-known vacation destination can be felt all through the area – from the quiet farm areas of the Northeast corner to coastal towns. Contact the Eastern Regional Tourism District/Mystic Country for more information. Northwestern Connecticut is home to some of the state’s most dramatic scenery, from rolling hills to picturesque waterfalls, as well as wineries, trails, charming towns and much more. Contact the Western Connecticut Convention & Visitors Bureau for tour information about the Litchfield Hills and Fairfield County regions of Connecticut. Greater New Haven is rife with New England heritage, from lighthouses and charming town greens to world-class museums and Yale’s renowned campus. Of course, it’s also home to world-class dining, nightlife, live music and the #1 pizza in America. Contact the office below for tour and visitors information. 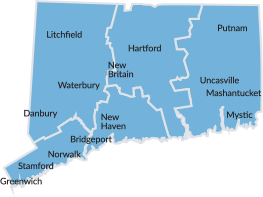 Stretching from the Massachusetts border to Hartford, along the CT River to New Haven and its neighboring shoreline towns, the Central Regional Tourism District promotes Connecticut's River Valley and The Greater Hartford region as a vacation and sight-seeing destination for visitors to New England. Whether it's a convention, meeting venue or a sports stadium you're looking for, our team knows the Connecticut turf and its players. Need a contact? An introduction? Housing? Contact our office for more information or visit our website.